Discover the rustic charm of the modern farmhouse style with this rustic wood picture frame. 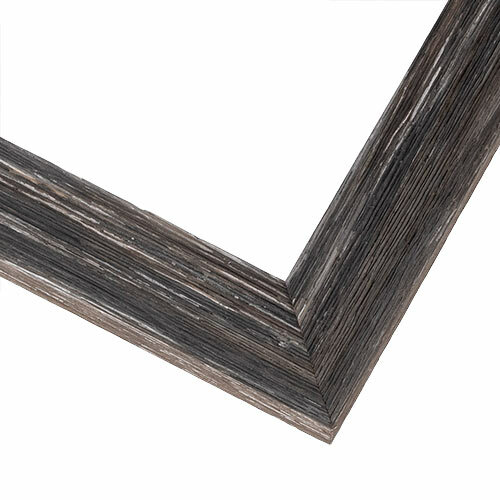 With dark and light grey coloring and a flat profile, this is a delightfully rough-to-the-touch frame made with real wood sourced from sustainably managed forests. Its knotholes and grooved distressing will add the mystique of barnwood when to framing landscape paintings, nature photography and family photos. I have a painting with a weathered post in it and this frame is compatible with the theme. I am framing an original piece of art 48x32cm. A blue pen drawing on mat board of the harbor at La Palais, Belle Ile En Mer, France. I wanted to have a simple frame that maintained the weather-worn look of the French Coast. I think this frame achieves the desired look I am after, complimenting without overpowering the delicate image.